Back to the belt. It’s useless when trying to belt a dress in a fashionable way. 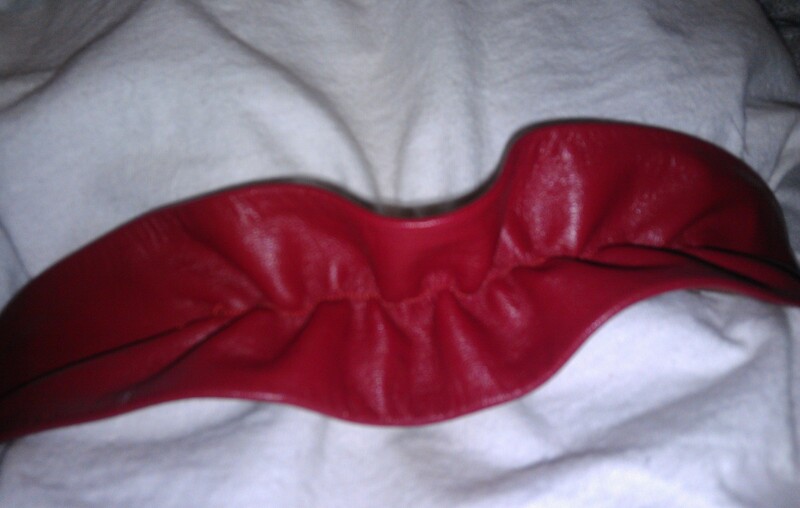 I decided to put elastic in the back of it. 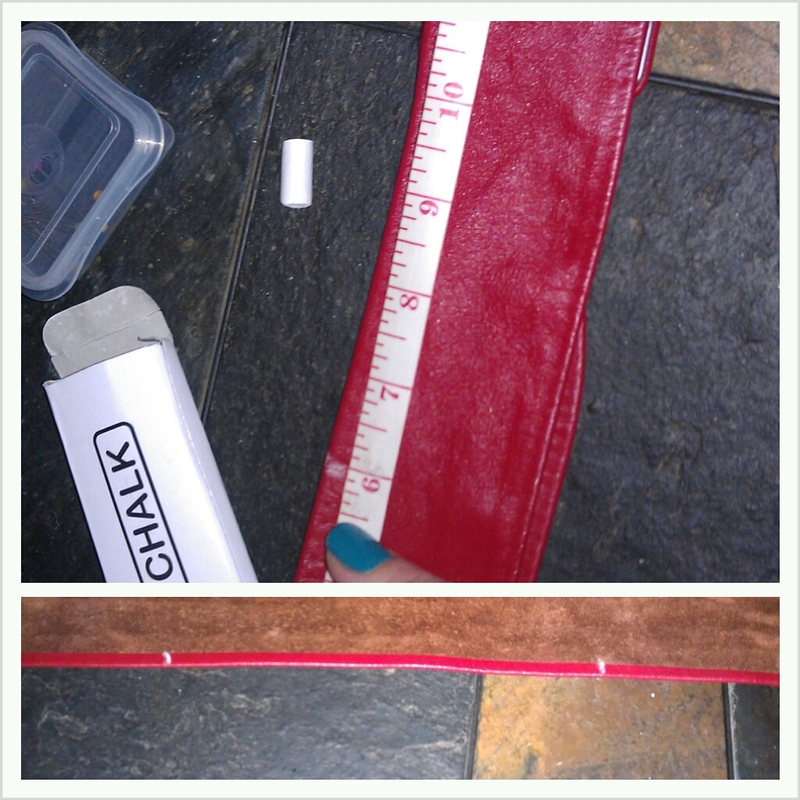 I measured the length of the belt and then marked the 7 inches in the middle of it with chalk. If you aren’t hip to chalk, it’s probably my favorite seamstress (and artist) tool. You can mark on anything with the ability to wipe it off when you are through. Sometimes I even use a white crayon. 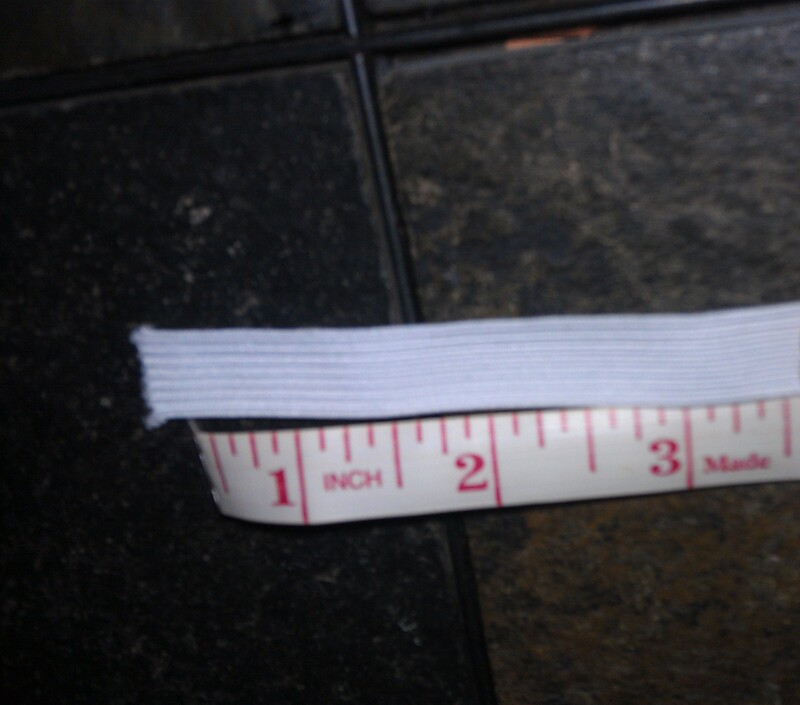 After marking the seven inches in the middle I cut a strip of elastic that was half as long. 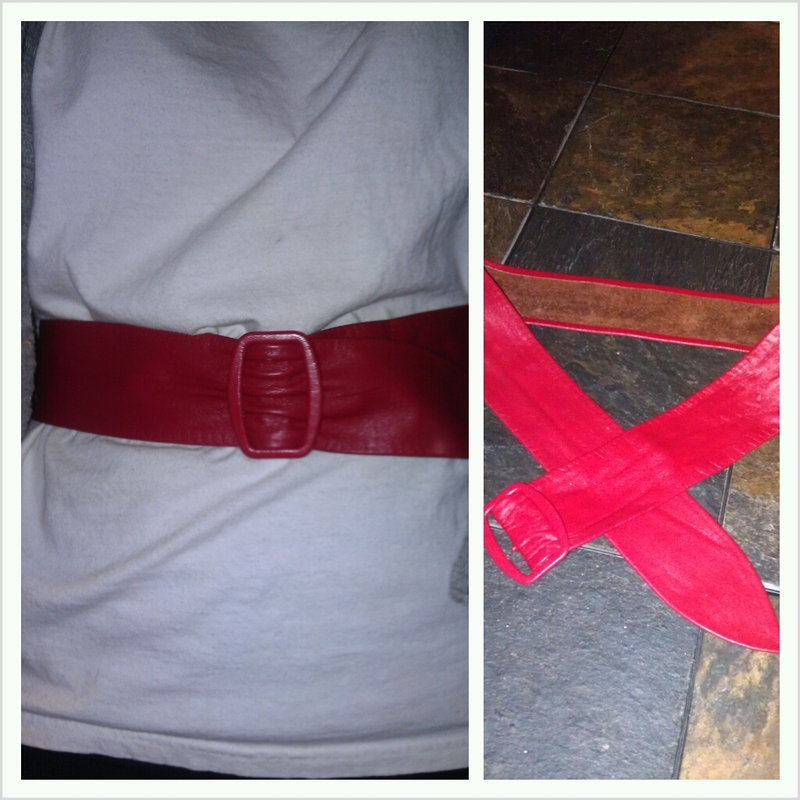 I measured the full width of the belt, then pinned the elastic to the middle. I wanted to do it closer to the one side in the beginning of the project, but later decided on the middle. 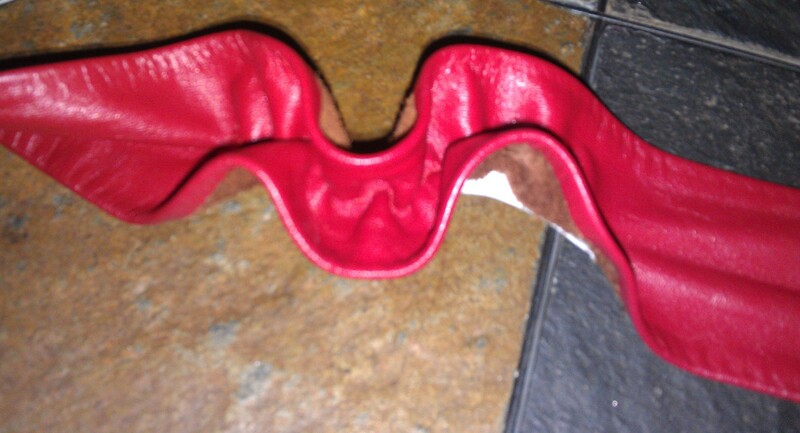 I only pinned the beginning of the elastic (by one of the chalk marks) because I am going to stretch it while I sew. I measured the belt to a place on my machine where it’s in the exact location that it needs to be in order to come out straight. 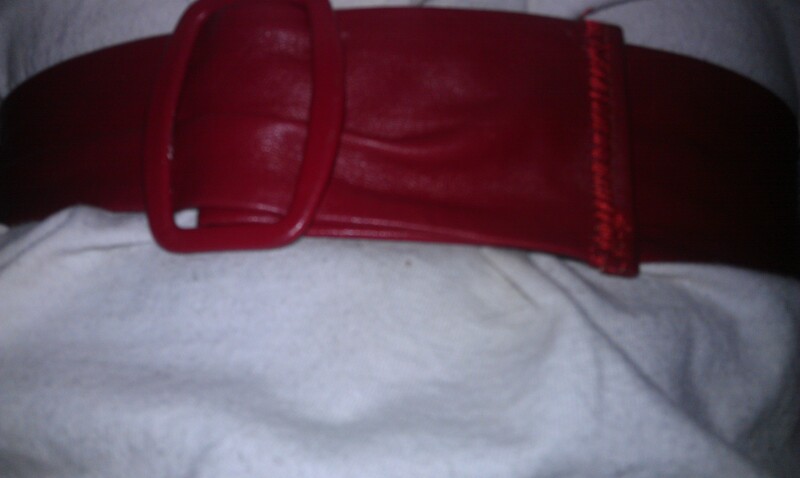 I lined the elastic up to the left side of the foot to keep it in the middle, while keeping the belt on the edge of the metal where it was lined up. 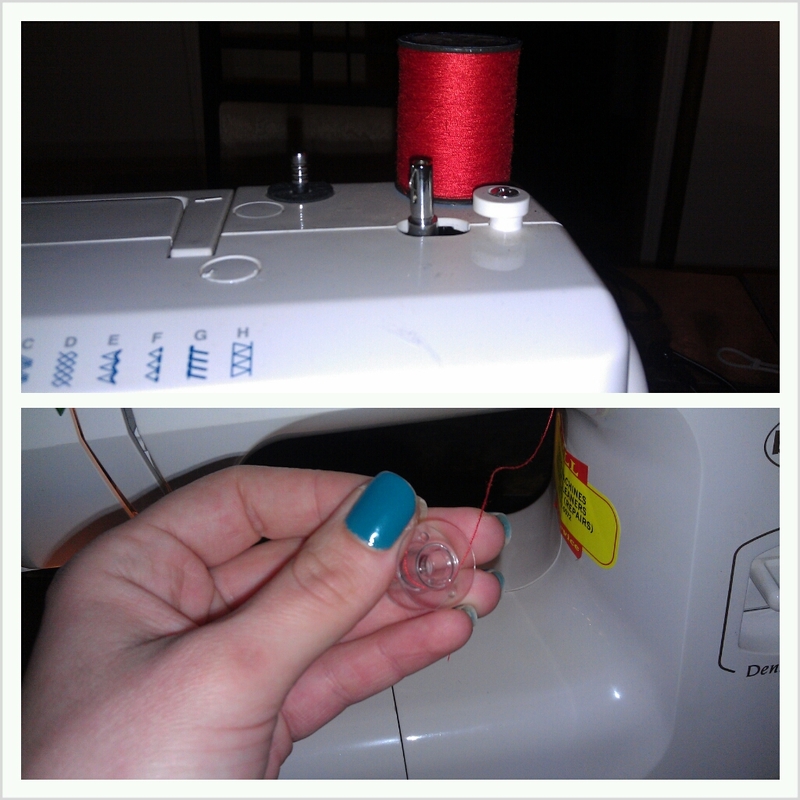 I loaded the machine with the red thread and bobbin. Then I got started. 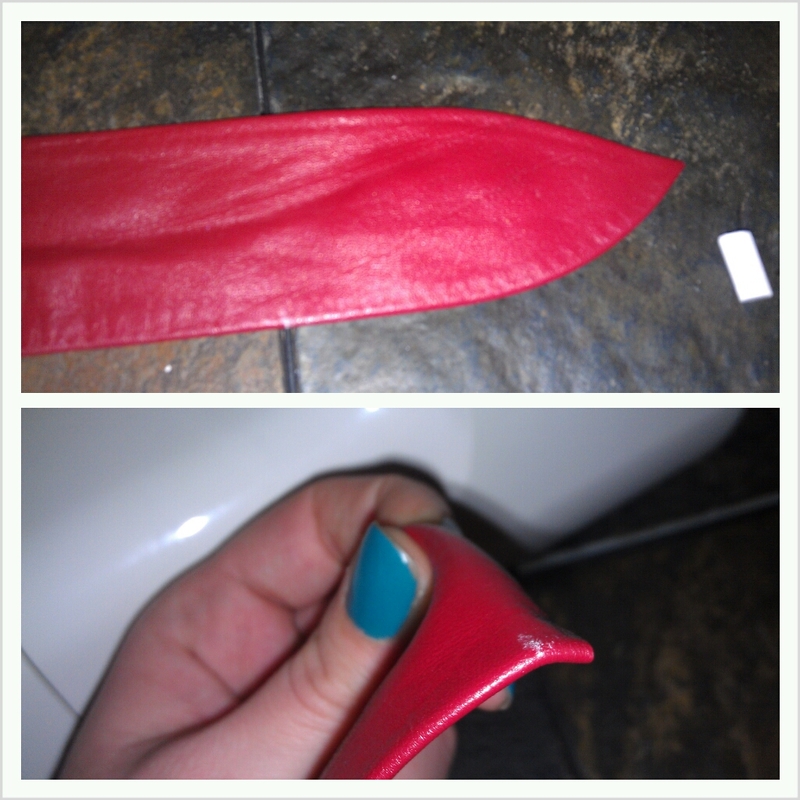 Put the foot down on the elastic, on the same side it’s pinned down, then sew a few stitches back and forth to lock it. Pull the elastic to the other chalk mark and continue to sew (making adjustments in the tightness of the elastic) until you get to your other chalk mark. 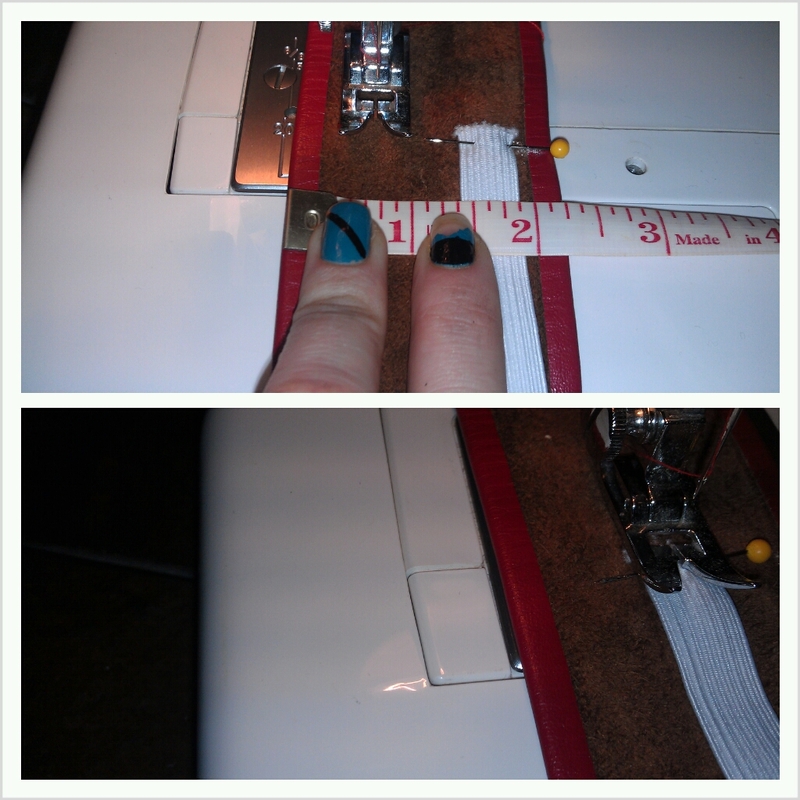 Do the back and forth stitch to lock it and your finished. It should look like this. Fancy. That’s the back, now the front. I cut off the weird pointed edge after measuring how much I had to play with (take note of the chalk mark). 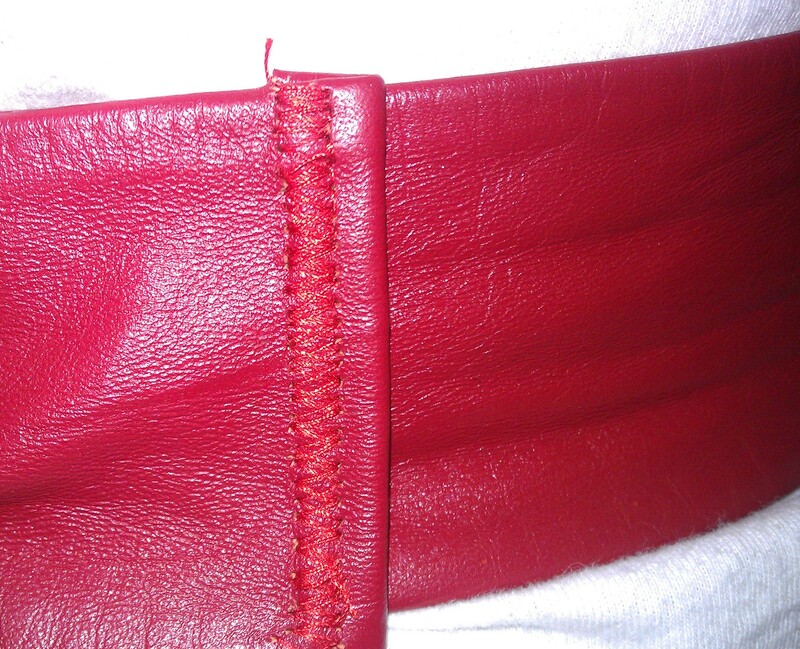 Then I hemmed it with a zigzag stitch a few times over to create the image of tight stitching. 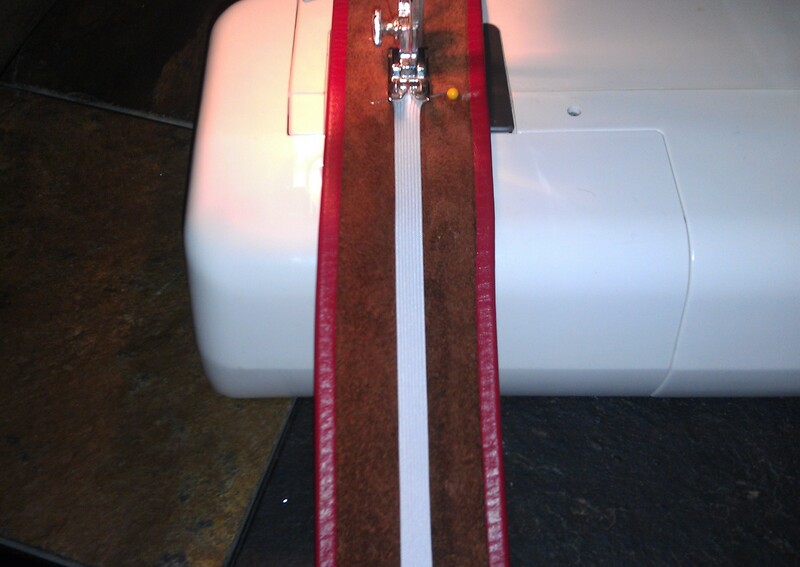 Looking back on it, I had too much to drink to remember that I could have adjusted the stitch length on the machine, whoopsie. This is what it looks like on! I will get you a picture with an outfit, because I am sure that I can wear this belt now!